Thanks Ron. I’ll get some breakers on order. I just noticed that my heated bed plate and build plate are isolated from the equipment ground connected to the electronics enclosure. Delrin nuts are good insulators. I’ll have to add a grounding wire into the braid. Just waiting for my E3D Aero to arrive. Went from Kansas City to Hawaii, round about way to AK. Most of my stuff ends up in AR Arkansas. We almost moved there when I was a kid. I kind of wish we had. It would have been to Anchorage had we done so. As for a $30 controller versus a $5 SSR or $10 MOSFET board (referring to @mstrauss's posting above, which I sent a like to ), yes I wholly concede that it is a cheap board to start with. That of course is part of the problem. It isn't so much the loss of an extra $20 though as it is having to physically replace it and all its connections and the loss of assorted tweaks you may have made to the board and its EEPROM settings. Yes, I know that you can upload most of that. But it is a PITA anyway. Don't some people pay that much for high-end filament? I don't know, I have been using some pretty cheap filament lately. But some people do spend more on a roll of it than I spend on gasoline in a week or two I'm sure. You mentioned posting a picture of adding a 1N4002 diode to protect the drivers when powering down and leaving the usb cable connected. Where is the photo? I have searched and can’t find it anywhere. I would rather spend $60 protecting the $30 board than go through the hassle. I know the board is designed to work without all the mods. But when you run machinery or electronics at 80 to 110 percent of what it is designed to do the chance of failure increases exponentially. I have always been taugh throughout my career to take care of the equipment because sooner or later you may want/need it to take care of you. Rather than trying to find it (I have lost track of it here myself) let me take a fresh photo and post it later this evening. It is really simple to do and it works. I share your philosophy that an ounce of prevention is virtually always worth more than a pound of cure (not to mention the time and trouble). Plus I genuinely don't trust these boards when running at anything remotely close to their current capacity. There are loads of photos and testimonies about PSU, controller board, connector and other assorted failures (including actual fires) that ultimately were due to overheating, poor connections or overloaded connectors. This is located on the unused second extruder drive board socket. It bridges the +5 to the +Vmotor connections with a 1N4002 diode, cathode to the +Vmotor as shown. An MUR120 or a Shottky diode would be better (lower forward voltage), but this works well enough. Whatever you use should have a rating of at least one ampere and 50 volts to be on the safe side. I just happened to have (literally) about a thousand of these sitting around. I soldered it onto a pin header strip and then just plugged it in. If you were careful I suppose you could insert the rectifier leads directly into the socket, but they might be a bit tight and could easily ruin the connector if you ever wanted to add a second extruder later on. Better to use a pin header strip (0.1" centers, 0.025" square pins). Speaking of cheap filament, I was printing this thing out of PLA last night and was using cheap filament ($18 for a kilogram reel). Oh my Lord that stuff is hard. My MK8 extruder had a really tough time gripping it and it kept slipping. I think it's time to change over to the E3D Titan setup I bought. Sorry for all the dirt and garbage in the photo (it is actually there, they are not photo artifacts). The large enclosure fan I am running probably needs a dust filter. Add it to the list...... sigh. I will be curious to hear how your E3D Aero works out. I am already making modifications to the Titan I have because I want a proper filament guide in the form of a grooved roller. That requires a complete re-make of the lever arm due to an increased OD. In addition I am adding ball bearings to where it rides on the motor shaft. Somewhere in the future I will fabricate my own reduction gear assembly for it that will use a 5mm shaft and standard (easily and cheaply replaceable) toothed wheels. Just to be clear, you run an external mosfet on the cartridge heater for the hot end as well as the heated bed? Is the setup similar to the heated bed? I am running a 120 volt AC mains powered bed heater with a 10 amp AC SSR to drive it. But the idea is similar to what a MOSFET booster does. I am running a 24 volt hot end heater cartridge (60 watts) using the on-board MOSFET currently. However, when I get some mechanical issues sorted out with my E3D Titan extruder and the Bowden tube setup I will also be installing the old external MOSFET board I have to control the hot end heater. 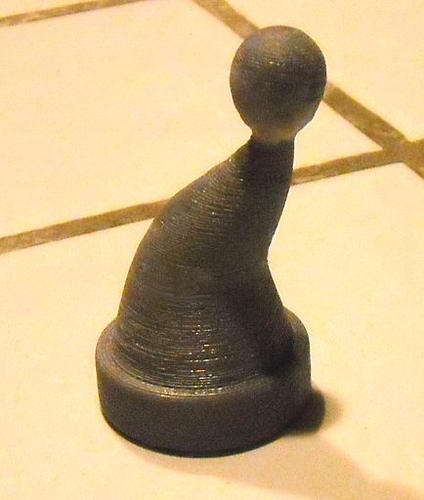 I usually do things like this in batches when I have the printer out of service anyway. It will be happening very soon. BTW, I just printed something this evening. Four minutes flat from power on to printing. I love the mains-powered bed heater (which used to take forever). @Ron What was that temp conductive pad you added between the glass and aluminum? It is Berquist "Gap Pad" GPVOUS-0.060-00-0816 and in raw form is 8"x16" (406mm x 203mm) in size and is 0.060" (1,52mm) thick. I used a paper shear to cut an 8"x10" piece and then cut up the left over piece to form a 10" square from all the pieces combined. I figured that the 1" gap around the edges was of no consequence and so far it hasn't been. It may be a bit extravagant, and perhaps is a bit overkill (frankly). But I literally have had portions of two sheets of it sitting around my work room for years so I figured "why not?" The thing I like about it is that it mushes out a little to compensate for surface imperfections. So the thermal path between the aluminum plate and the glass mirror tile is good. Because it does not have adhesive on its faces I can lift off the mirror tile for cleaning or replacement easily. Would this work for the hot end heater? Also, I am looking at the heater that Robotodigg offers, 110V AC 300W. You mentioned that you have a 500W version. What would the difference between these two be? My guess would be that the 500W version should heat up quicker, how much quicker? 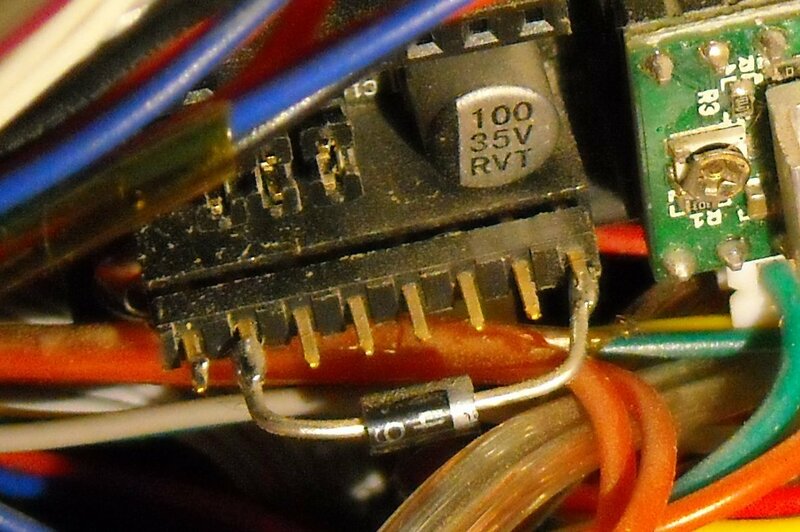 Yes, that particular DC-DC "relay" will work fine for the hot end heater (either version, 10 or 25 amps). Just be careful not to accidentally wire it up to an AC-powered bed heater (or vice-versa). As for the mains-voltage bed heaters they offer, I specifically requested 500 watts rather than 300 watts because at the time they also had a listing for a 500 watt version on their web page. I had to wait an additional week or two to receive it as I recall. You might want to email them and ask how much of an additional delay might be involved (if any) at the present time. As for how much faster it will heat up, I can't say for sure, but I suspect quite a bit faster. I was concerned about the 300 watt version because the original 12VDC version from FT was supposed to be around 300 watts itself. I figured that if I was going to all the trouble to upgrade it, I wanted way more power. So I went with 500 watts (at 110 volts). At our house the AC mains run more like 122-125 volts, so in reality it runs at around 625 watts. Some people (@walter as I recall, I could be wrong) have gone to even higher power, such as 750 watts. That was another reason that I opted for 500 watts rather than 300 watts. 300 watts seems fine for smaller (such as 200x200mm) build plates, but if you scale that up to 300x300mm and try to keep even close to the same power per square inch (or square cm as you prefer) you will need about 2.25x the power. So that works out to (drum roll......) 675 watts. Mine is close enough at 600+ watts (actual). Oh, and also I have a thick aluminum heater plate now (0.25" thick) rather than the thin original plate. Lots more thermal mass to heat up. I can also tell you that with 500 watts (nominal) I did not have to re-tune my PID parameters at all. With much higher power than that you probably will have to do so or it will overshoot or hunt the setpoint. Yes I have a 750W version, but I limited power to approx 400 W which seems to be more then enough. I have a 4mm cork insulation layer under the bed. Mine runs fine at its full output power, but then again I have around an 8mm air gap and reflective barrier insulation underneath it. Plus it has the 0.25" thick heated plate (which is also over-sized in X-Y to accommodate the overtemp safety switches). So I am heating quite a large mass, perhaps 3x (or more) compared to the original build plate. On a slightly different subject, I am in the process of getting used to my new Titan Bowden and Volcano setup. I am seeing some immediate improvements in speed, print quality, and part strength for sure, but I suspect that I will be tuning on it for a while yet before I am totally happy with it. What do you guys think the difference is between the mean well 24V PSU and the one that Robotdigg offers? Why is one 22, and the other closer to 35/40 on Ebay? I'm thinking about just getting the Robotdigg, PSU. I can get some decent 24V fans too all in the same place. Just a little leery I guess. Never mind, shipping from Robotdigg is crazy! I just want to thank you and all the others who have given me input here. I greatly appreciate it. I am hitting a bit of paralysis by analysis. SO many things to consider and choose from. I was looking at Robotdigg, and compiling a decent size order, power supply, heated bed, and some other vitamins. the cheapest shipping was close to the order price, if not over it. 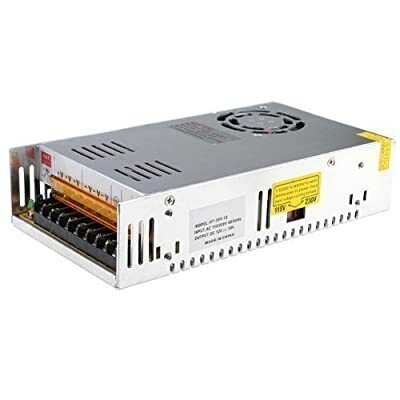 What are your thoughts on this power supply? The price seems almost too good, but it gets good reviews on Amazon. However, it looks pretty similar to the power supply that is provided with the stock kit. Not sure if the issue with people blowing out the power supplies is the fault of the builders or the fault of the cheap power supply? I've not had any issues with mine, but I used crimp connectors and ferrules on all the wires so I could get good purchase and contact on the wires. Plus, I run the machine with the enclosure back off, and heat up the bed and hot end separately. I'm also looking at this for the heated bed: Thoughts? 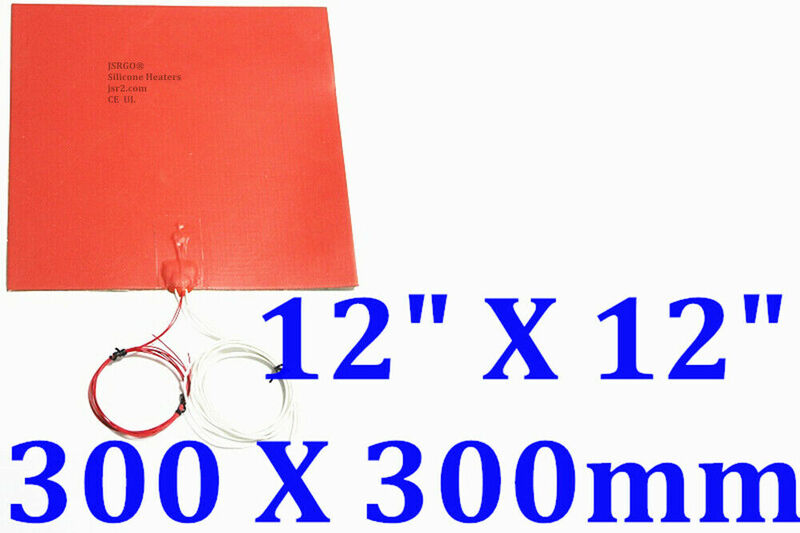 300 X 300 mm 11.8" X 11.8" with3M adhesive with Thermistor. 3D Printer Heated Bed Silicone Heating Pad Heater Mat. Engine oil base heating plate / 3D Printer heater board / Lithium battery heating plate /. | eBay! David, good to hear that! That's one of the reasons I (we?) do it for. - have a good reputation : I don't know the one you are mentioning. I have all Meanwell PSU's. Reputation can be estimated when looking at the spec sheets. Are they compliant to a number of standards? Is it their core business? A power supply is the core of your printer. It all starts with power. Not the thing you should save money on in my opinion. Cheap power supplies is a bit like gambling. Especially when you want to do long prints (I saw lately somewhere printing over 100 hours) Imagine a PSU failure at 80% complete... An MTBF (Mean Time Between Failures) indicator can be found in the spec sheets and if this refers to a MIL standard, you're good. To answer your question fault of the builders or fault of the PSU : for me it is fault of the PSU. A good PSU is robust and can handle overload, short circuits even misuse to a large extend. If the builder connects the mains voltage to the DC output, that's another issue. No remarks on the heater. 3M glue, wire insulation looks ok, power is sufficient. I use a 750W heater limited to 400W, I would just foresee an extra NTC between heater and bed. Just in case there is something wrong with one. It's almost impossible to replace a defective one afterwards. I hear you thinking that an NTC failure doesn't happen that often, it is a cheap measure to do. Another reason to do that is accuracy. I have the build-in NTC as a backup and use the NTC between ALU and heater as it gives a more accurate reading. Not sure if the issue with people blowing out the power supplies is the fault of the builders or the fault of the cheap power supply? Part of the issue is the quality of the stock power supply. The majority of the issue was the power draw of the bed. In order to get the bed up to a reasonable temp within a reasonable amount of time, the wattage had to be increased. This put a large strain on the low cost power supply and caused some failures. At 24v, there is much less strain on the power supply and I have not heard of one having issues yet. That being said, if you want a dependable printer and not have to worry about any issues down the road, spend the money now for a decent power supply. Look at it this way, if you have to replace a cheap one, the price just doubled.